I’ve been wanting to make birdseed ornaments for a while but I just couldn’t bring myself to search for suet (a must-have ingredient in most birdseed ornaments). This recipe doesn’t call for suet or gelatin, and it doesn’t involve messy peanut butter! These ornaments will be great for the winter, when birds really are in search of food, but I didn’t want to wait until then to make them! I’ve hung these birdseed ornaments on a tree just below our balcony where I can watch birds munch away. 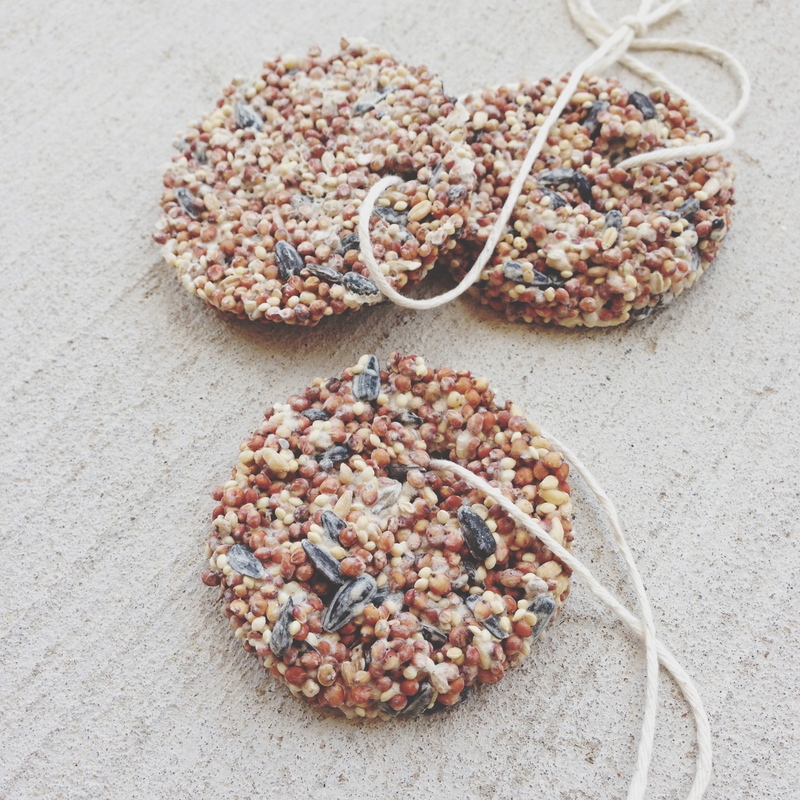 You can make your own bird feeders with this simple recipe! Check out my Pumpkin Bird Feeder to find out how to turn a pumpkin into a fun Fall treat for birds! You can find the tutorial here. Mix together all ingredients. 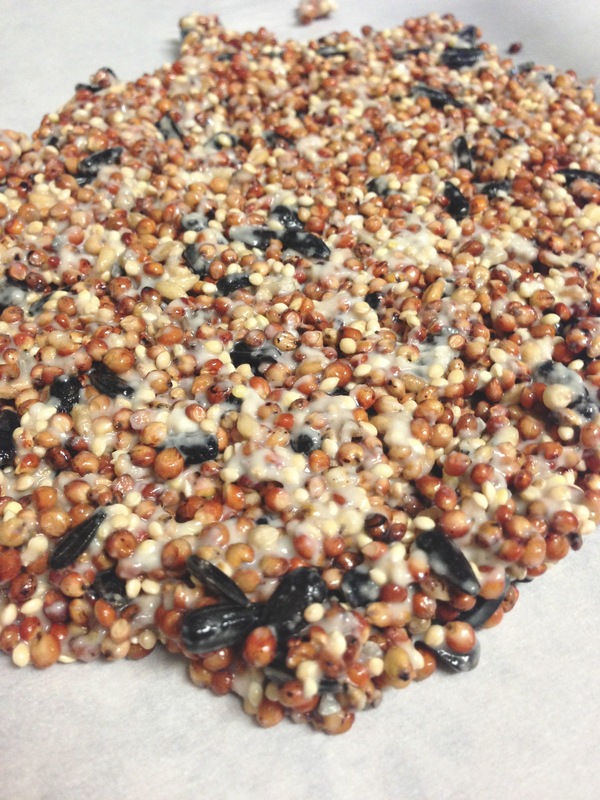 On a piece of wax or parchment paper, press the birdseed mixture out into a layer that is 1/4″- 1/2″ thick. 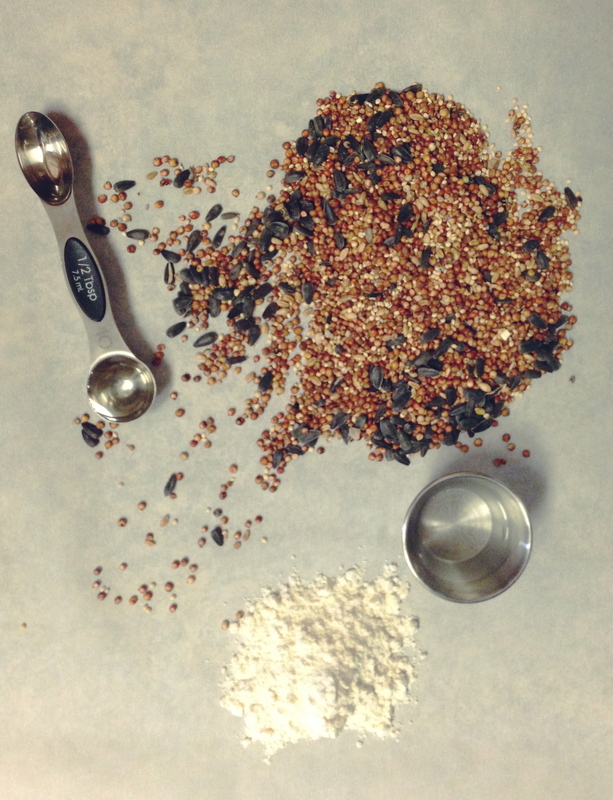 Use a cookie cutter to cut into the birdseed layer, remove excess birdseed from around your cutter. Use a drinking straw make a hole in your ornaments. Let ornaments dry overnight, then flip them over and let dry on the other side. Use kitchen twine or string as hangers for your ornaments. Hang these homemade bird feeders in tree branches (in a spot where birds will be able to perch) and enjoy some bird watching! This is so cute Shae! I’ve always heard of peanut butter used as the binding agent for this and I although I’ve never done it myself, I can imagine how messy it could get. Yours looks perfect! These look great and so simple! Even my husband just walking by, stopped and said, “Those look nice!” Big compliment from the man, as he’s not easily impressed. Thank you! I hope you try them, they’re perfect for winter! I made these last night. But mine are still gooey and falling apart. I will try again. I’m sorry that it didn’t work out. Maybe they’ll eventually dry out if left out for long enough? I hope you do give them another try! can you bake them to make them dry faster? I’m honestly not sure how birds would react to toasted birdseed… I would recommend letting the ornaments air dry. Thanks for that info, Dee! I had no idea! I love hearing that, Teresa! Thanks so much for commenting! These are really cute but I have concerns about the flour and corn syrup. This seems very unhealthy for birds which is counter productive to feeding them. Especially since most corn syrup is GMO. It seems like this would be detrimental to their health. Also, I would think it would mold quickly. I see the wisdom in your view and I definitely agree that an organic lifestyle is best! With that said, I don’t follow a strictly organic lifestyle for my family. In fact, I use corn syrup in several of the sweet recipes featured here on my website. Because these are ingredients that I use in moderation, when making treats for us, I don’t feel badly about doing the same for birds. :) I’ve never had a problem with mold, as they completely dry out very quickly. i’m trying these now! do you cut the ornaments before drying or after? mine are not sticky enough to keep together at all right now. all my store had was lite corn syrup. will that work? Yes, light corn syrup should work! :) You could try a little more flour and corn syrup to make it a bit more pasty. The mixture won’t be so sticky that you can pick it up and form it into a shape, but it should be cohesive enough that you can spread it out for cutting. 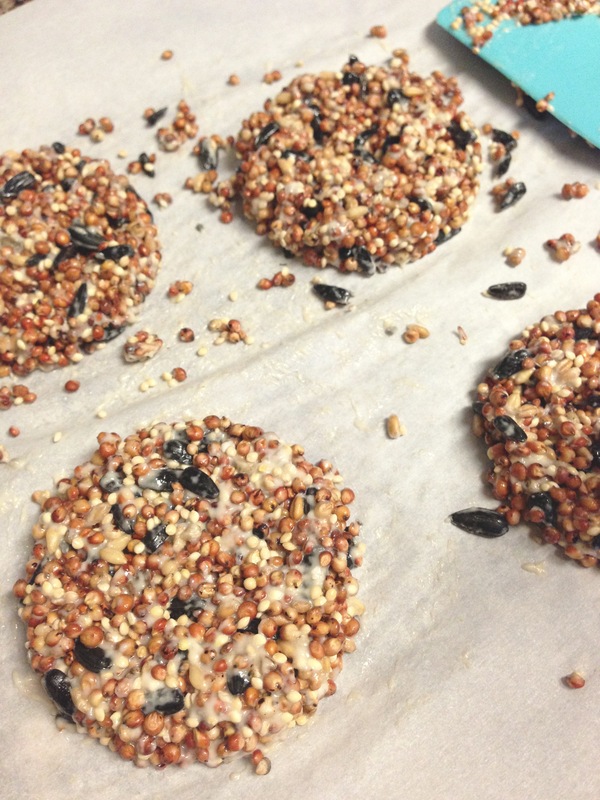 Great recipe but would suggest cornmeal or oats as a substitute for flour. This recipe will become my base ” go to” recipe. Thanks for sharing!